If you have an interest in playing jazzy lines in almost any context, then it is important to realize that there is going to be a lot of bar movement and the need for coordination with the picking hand. Many of the lines that you hear in jazz utilize chromatic notes and scales such as the melodic minor, harmonic minor, augmented and diminished (octatonic) scales. Approaching these types of lines and scales on a lap steel is extremely challenging. I have written two books which were meant as guides to opening up new approaches to playing these types of scales and lines, Bebop Lap Steel Guitar, which uses bebop heads to introduce new strategies for approaching these lines in C6 tuning as well as some simple but informative scale patterns, and Steelin’ Scales and Modes, which introduces a simple system of looking at scales in four note groups called tetrachords. Both books were written from my perspective and are largely the way I look at playing steel guitar in this context. I believe these books to be worthy of your attention. There are definitely a lot of players who have no interest in this sort of thing and don’t believe the instrument was made to be played this way. To them I say, do your thing, man, I’ll do mine. Or maybe there are naysayers who have attempted to play jazz on lap steel but find that the music suffers from the challenge of playing fast lines. This is somewhat true–it is extremely challenging to do and there is a steep learning curve. While the lap steel may seem novel in a setting with jazz musicians, you are still expected to be able to hang on some level, and that means having your chops and your ideas together. Nothing is going to make that happen except for some serious, dedicated practice. I spend a lot of time these days simply playing heads and lines along with a metronome. I start off slowly, trying to look at little blocks of the line and figuring out the most sensible place to play each part of the line. 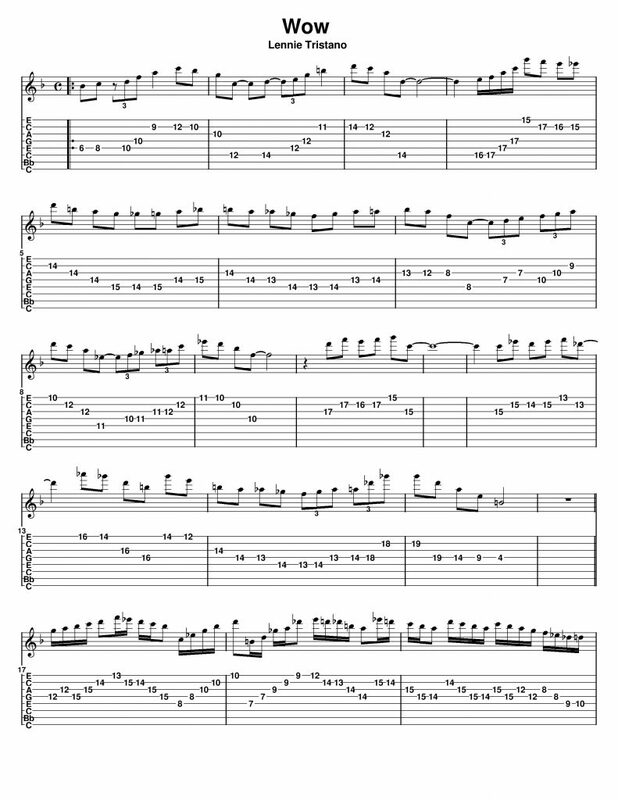 I may change the way a play a little four or five note sequence several times before I arrive at the most efficient and effective way to play it. A lot of it has to do with what follows or comes before–the whole line has to be able to flow together, and the fingers and bar need to find their positions smoothly. Any inability to do that smoothly results in either dodgy pitch, fumbling fingers, and a loss of rhythmic continuity. I am very much in love with jazz and I have been for most of my life. While never really being regarded as a ‘legit’ jazz player by anyone, including myself, it has always been my lifelong passion to listen to and study jazz deeply. Much of the teaching for me comes from simply listening to a lot of music. I put a lot of time into learning the language of music to a degree and I am comfortable with communicating it pretty much. But I also have a very strong foundation in Popular music (Rock, R&B, Soul, etc.) that plays a large role in the way I hear my own music. While I love the harmony and melodic content of jazz, the rhythms and sounds of other musical styles definitely are my playground. You may have figured that out if you’ve heard my cd, Steelonious. I have recently been undertaking some of the most challenging music I’ve ever played, and that is the music of Lennie Tristano and the musicians who are strongly associated with him (Warne Marsh, Lee Konitz, Sal Mosca, Jimmy Halperin, Connie Crothers, Ted Brown). The music is not really new for me, but actually delving into playing this challenging music on lap steel is. Lennie and company often wrote new melodies or lines over the chord changes and forms of standards. This was something Lennie did with his students and some of those tunes have become very popular among musicians. Perhaps the most challenging piece I’ve arranged for steel guitar as of this time is the tune “Wow” written by Lennie over his reharmonized changes for the tune You Can Depend On Me. The melody is progressive, not quite bebop, but not exactly not bop, and the lines are long. However, the bridge is where the title Wow came from. It is all doubled up into sixteenth notes and in harmony among the tenor and alto, and the line flows effortlessly over the bar line. My first reaction about playing this tune was that it was impossible, but I wanted to give it a crack anyway. I worked hard at getting through the A and B section of the tunes, and could just about play them in tempo with the recording, which I think is somewhere around 160-170 bpm. Then came the bridge–wow, indeed. I struggle to play the bridge beyond 100-110 bpm, though the first few bars of it come a little easier for me. 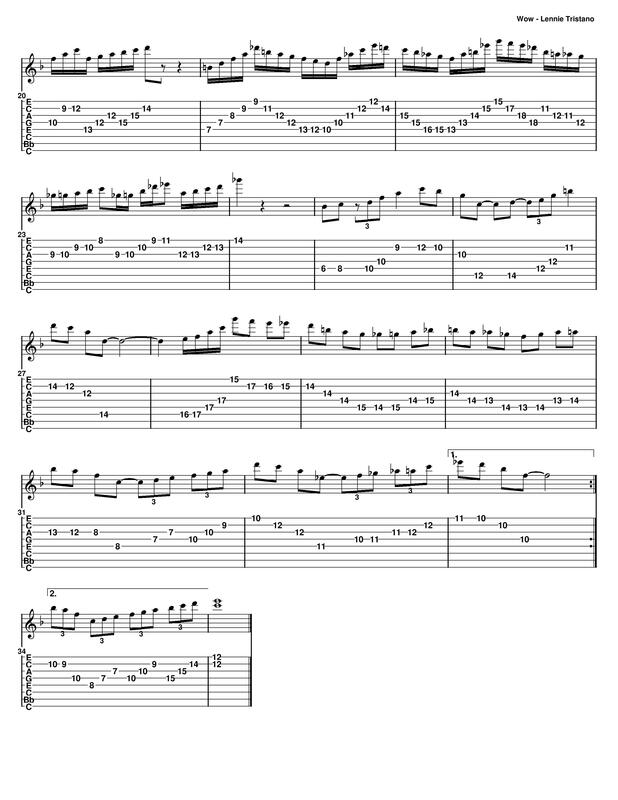 I’d like to share with you my tab for the tune Wow and if you are so inclined, you might be able to see how I approach playing some of this tricky stuff. The one goal is to always make it sound good, and not to sound like I am struggling to play it. That may come in time, or maybe not. But I do believe that with the tab you see here, I have put forth my best possible effort to make it playable and I will continue to practice it daily with a metronome until I am comfortable enough to play the arrangement of it that I hear in my head. Have a look. I’ve excluded the chord changes on the chart and I am have only included the upper harmony part on the bridge. Also, I did not include any right hand picking designations, as this is something I am still working on, and well, you should figure it out for yourself. There are also a number of slides that I intentionally left out of the tab, but I use a fair share of them.